Welcome to the Monticello Chamber of Commerce & Industry located in Monticello, Minnesota. Monticello is conveniently located on I-94, between St. Cloud and Minneapolis, along the banks of scenic Mississippi River. Monticello Chamber of Commerce & Industry represents the interests of over 300 companies doing business in Monticello and the surrounding communities. Monticello is a community where we take business to heart. The Monticello Chamber of Commerce & Industry is a Business Organization that serves to strengthen our member businesses and stimulate regional prosperity. We are not a government agency, civic or service club. Our Mission: To continually support, serve and enhance all business sectors in the Monticello area. The Monticello Chamber strives to strengthen communication among business, industry, school, government, service organizations and area residents. Program of Work: Member Services, Business Advocacy, Economic Development, Community Partner, and Providing the Front Door to our Community! 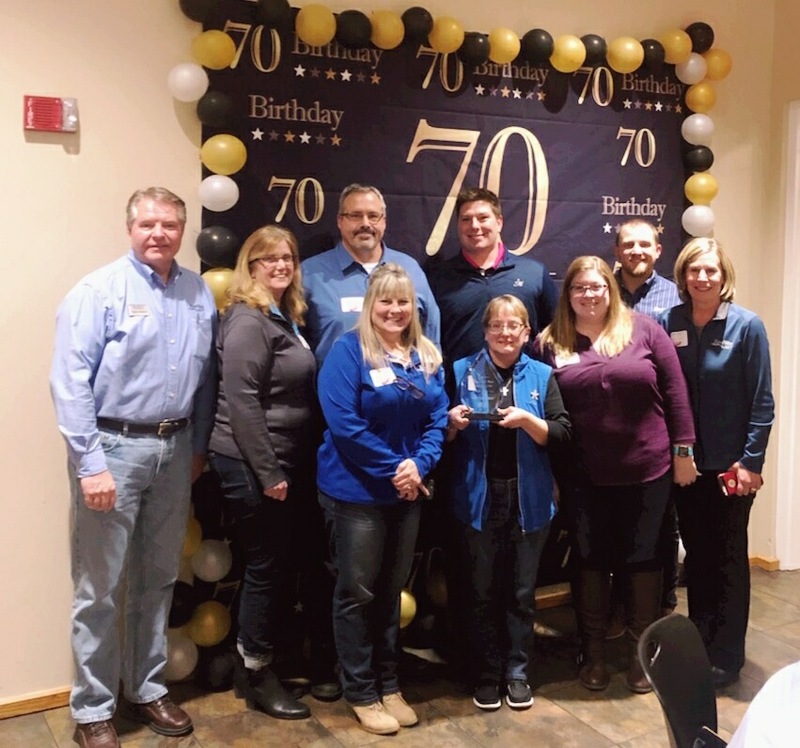 This year's Annual Banquet theme was Celebrating 70 Years as a Chamber! The selection criteria is the business must be a member of the Monticello Chamber, has been around for at least 5 years, has a consistency of service and/or products to its customers and community, promotes the betterment of the community as a business, encourages employees to be involved in the community and has not received this award in the past 5 years. Past 5 years winners are: 2107 Von Hanson's Meats & Catering, 2016 Ausco Design & Marketing, 2015 Schlenner Wenner & Company, 2014 Best Western Chelsea Inn & Suites, 2013 All Elements Inc and 2012 Lommel Photography. Our 2018 nominees were: Foster White Insurance Agency, Great River Spine & Sport, Lucille Murray's Studio of Dance, Monticello Family Dentistry, RiverWood Bank, The Crummy Boys Shop, UMC, and West Metro Buick GMC. Congratulations to all of the deserving nominees! We are so lucky to have such a strong business community in Monticello. Join us for the 2019-2020 Coronation on Sunday, July 14, 2019 at 4:00 pm in Ellison Park (behind CentraCare Health). Grace Schillewaert-Loch Jewelers was crowned 2018-2019 Miss Monticello. 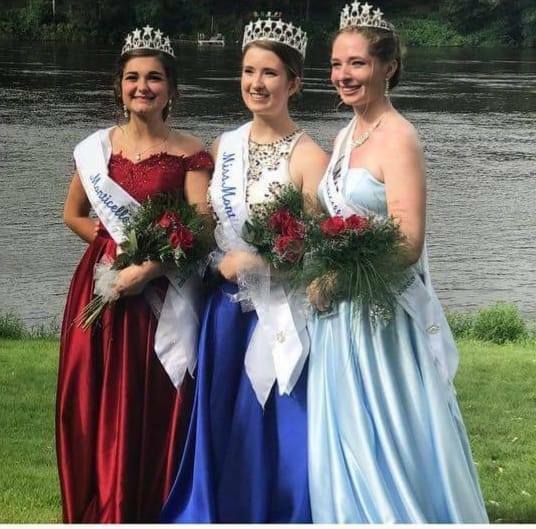 Grace will represent Monticello now through Riverfest 2019, along with 2018-2019 Princesses Sydne Jude and Meghan Larson. Sydne was also recognized by her peers with the Miss Congeniality award, as presented by sponsors Monticello Women of Today and Loch Jewelers. (Left to right) Princess Sydne is sponsored by Bliss Salon, Queen Grace is sponsored by Loch Jewelers and Princess Meghan is sponsored by NAPA Auto Parts. We would like to thank all of the candidate sponsors for their continued support of this wonderful program and we look forward to working with you in the future: Schlenner Wenner & Co., CentraCare Health-Monticello and St. Benedict's Senior Community-Monticello, RiverWood Bank, Belde Chiropractic & Body Shop, Bliss Salon and Loch Jewelers. We would also like to give a special thanks to our event sponsor for the Red Carpet Gala/Judging Reception: All Elements Inc.
Take a Tour around Monticello and see all that Monticello has to offer! Click here to view Video Tour. Monticello is located in Wright County. Click here to view our county profile. Click here to view the Wright County Annual Report.